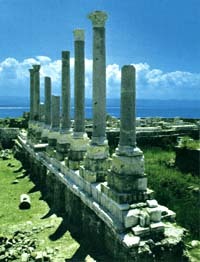 Phoenician Tyre was queen of the seas, an island city of unprecedented splendor. She grew wealthy from her far-reaching colonies and her industries of purple-dyed textiles. But she also attracted the attention of jealous conquerors among them the Babylonian King Nebuchadnezzar and Alexander the Great. In the 10th century B.C. Hiram, King of Tyre, joined two islets by landfill. Later he extended the city further by reclaiming a considerable area from the sea. Phoenician expansion began about 815 B.C. when traders from Tyre founded Carthage in North Africa. Eventually its colonies spread around the Mediterranean and Atlantic, bringing to the city a flourishing maritime trade. But prosperity and power make their own enemies. 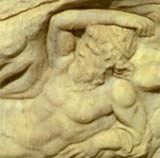 Early in the sixth century B.C. Nebuchadnezzar, King of Babylon, laid siege to the walled city for thirteen years. 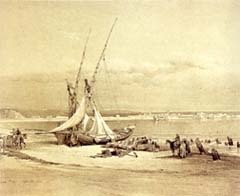 Tyre stood firm, but it was probable that at this time the residents of the mainland city abandoned it for the safety of the island. In 332 B.C. Alexander the Great set out to conquer this strategic coastal base in the war between the Greeks and the Persians.Unable to storm the city, he blockaded Tyre for seven months. Again Tyre held on. But the conqueror used the debris of the abandoned mainland city to build a causeway and once within reach of the city walls, Alexander used his siege engines to batter and finally breach the fortifications. It is said that Alexander was so enraged at the Tyrians' defense and the loss of his men that he destroyed half the city. The town's 30,000 residents were massacred or sold into slavery. 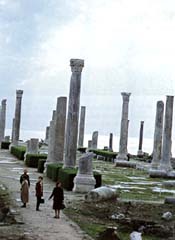 Tyre and the whole of ancient Syria fell under Roman rule in 64 B.C.. Nonetheless, for some time Tyre continued to mint its own silver coins. 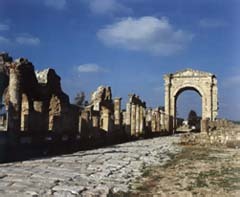 a triumphal arch and the largest hippodrome in antiquity. Christianity figures in the history of Tyre, whose name is mentioned in the new testament. During the Byzantine era, the Archbishop of Tyre was the primate of all the bishops of Phoenicia. With the decline of the Abbasid caliphate, Tyre acquired some independence under the dynasty of Banu 'Aqil, vassals of the Egyptian Fatimides. This was a time when Tyre was adorned with fountains and its bazaars were full of all kinds of merchandise, including carpets and jewerly of gold and silver. 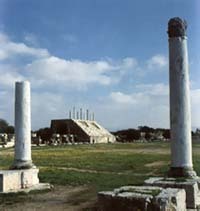 For a period of nearly 50 years the General Directorate of Antiquities excavated in and around Tyre, concentrating on the three major Roman archaeological sites in the town, which can be seen today. from the site. The importance of this historical city and its monuments was highlighted in 1979 when UNESCO declared Tyre a world Heritage Site. In the meantime, government efforts have stopped much of the wartime pillaging that Tyre's archaeological treasures have suffered because of economic stress in the area and international demand for antiquities. Grassroots campaigns have also drawn attention to the importance of the city's antiquities. The Triumphal Arch Area One, located on what was the Phoenician island, is a vast district of civic buildings, colonnades, public baths, mosaic streets and a rectangular arena. the great stone breakwaters and jetties of the ancient Phoenician port, called the "Egyptian port" because it faced south towards Egypt. Area Two, is a five minute walk to the west. Its major point of interest is a Crusader cathedral. Only the lowest foundations and a few re-erected granite columns remain intact but these are nevertheless impressive. The area below has revealed a network of Romano-Byzantine roads and other installations. Visitors are not allowed inside the site, but the ruins can be viewed from the road. of the largest Roman hippodrome ever found. century A.D. 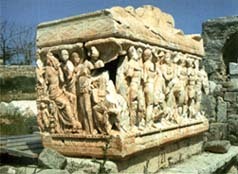 The necropolis, excavated in 1962, yielded-hundreds of ornate stone and marble sarcophagi of the Roman and Byzantine periods. 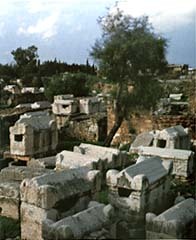 Foundations of a Byzantine church can also be seen. The archway stands astride a Roman road that led into the ancient city. Alongside the road are the remains of the aqueduct that assured the city its water supply. (See reference to Ras El-Ain). The 480-meter structure seated twenty thousand spectators who gathered to watch the death-defying sport of chariot racing. Each end of the course was marked by still existing stone turning posts (metae). Charioteers had to make this circuit seven times. Rounding the metae at top speed was the most dangerous part of the race and often produced spectacular spills. The walk to Area Three takes you through a residential part of Tyre called Hay Er-Raml or the Quarter of Sand. You are in fact walking on what once was Alexander the great causeway. Accumulating sands and extensive landfill have expanded this old land link to the extent that modern visitors have the impression that Tyre is built on a peninsula. 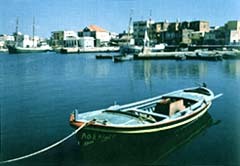 see a busy fisherman's port, in Phoenician times referred to as the "Sidonian" port because it faced north towards Sidon. Walk along the port with the sea on your right and you enter the city's Christian Quarter, a picturesque area of narrow streets, traditional architecture, and the Seat of the Maronite bishop of Tyre and the Holy land. One medieval tower still stands in a small garden. A second one is visible under the little lighthouse. During Crusader times towers similar to these ringed the city. The archeological sites are open daily. Several seafood restaurants and pubs are located in the port area and fast food places have opened in the Hay Er-Raml area. Local restaurants fare is good. Skin Diving: Basic equipment is sufficient for exploring the Phoenician breakwaters and jetties. Look for the Murex, still living along Tyre's shores among the rocks and sunken archeological remains. 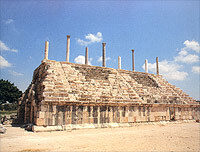 Ras el-Ain (6 Kilometers south of Tyre) has been Tyre's main source of water since Phoenician days. Its artesian wells gush up into stone reservoirs that have been maintained through the ages. One of the reservoirs fed the arched aqueducts of the Roman period that once that once stretched all the way to Tyre. Remains of these aqueducts can be seen along the Roman road running under the monumental arch on the necropolis at Area Three. A short stretch of the original aqueduct near the reservoirs continues to serve as part of Tyre's present day waterworks. Sarafand (28 Kilometers north of Tyre) is the site of ancient Serepta, mentioned in the bible. Excavations here revealed the remains of Canaanite-Phoenician structures and Roman port installations. Modern Sarafand still has a workshop where the ancient Phoenician art glass blowing is practiced. Tomb of Hiram: On the road to Qana El-Jaleel, (6 Kilometers southeast of Tyre) is a burial monument from the Persian period (550 - 330 B.C.). This has traditionally been called the tomb of Hiram, the celebrated Phoenician architect of the Temple of Jerusalem. introduction of the alphabet to their country Cadmus, the son of a Tyrian king. The name of the continent if said to come from Europa, the sister of Cadmus. the process for historical purposes. Copyright� 1995-2003 Lebanon.Com Interactive. All Rights Reserved.